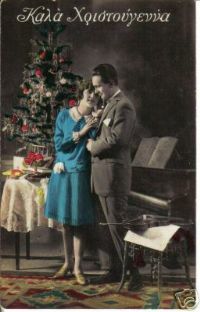 This vintage postcard is a nice one! It is a 1920's RPPC postcard view. It pictures a holiday view, with Xmas tree, violin and piano. A young couple pose for the camera. The card is beautifully hand colored. A nice collectible RP postcard view! Back of the card is is divided and is postally unused, although written on. Looks like writing in Greek. Condition is very good as shown.